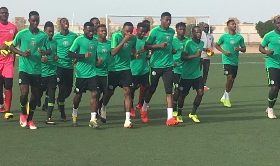 Nigeria U23s coach Imama Amapakabo has announced his starting line-up for Wednesday afternoon's U23 Africa Cup of Nations qualifier against Libya which will hold in the Tunisian city of Bengerdan. The big news is that Bologna loanees Orji Okonkwo and Kingsley Michael, and in-form Spezia striker David Okereke have been omitted from the starting XI following their late arrival to camp. Wikki Tourists netminder Adamu Abubakar got the nod from the manager to be in goal, ahead of Oremade and Galadima. Stephen Egbe, John Lazarus, Joshua Akpudje and Ebube Duru are the four defenders nominated to start the game. The midfield consists of skipper Azubuike Okechukwu, Arsenal loanee Kelechi Nwakali and Club Brugge's Dennis Bonaventure. Liverpool loanee Taiwo Awoniyi leads the charge for goals and will be flanked by Villarreal's Samuel Chukwueze and Olabiran Muyiwa. Manchester United product Tosin Kehinde has been named among the substitutes, along with Ojo, Etboy, Eze, Adebowale, Oremade and Olatunji.